Continuing my theme of gratitude, I’m lucky to live in a city with great Indian restaurants. Indian is one of my favourite types of food, and it’s always a great choice for vegetarians going out for supper. However, I’ve never had much success making it at home until now. This is the best dish I’ve ever made. 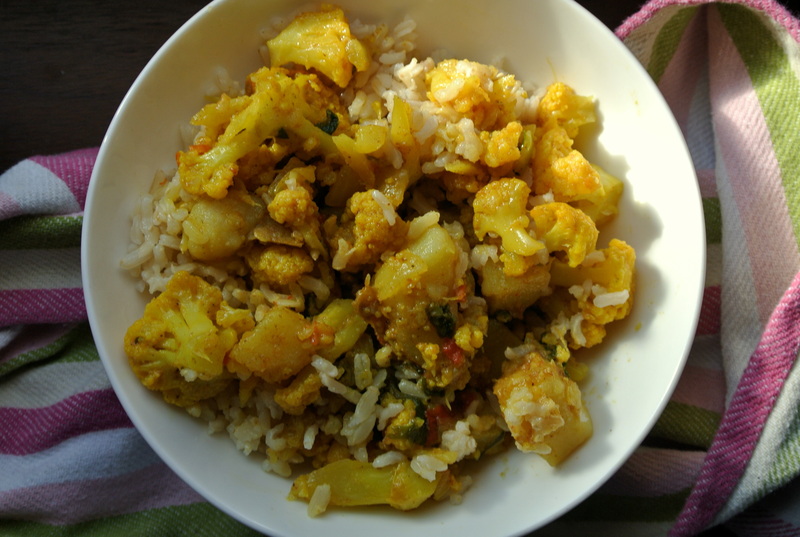 It’s a flavourful, not-too-spicy cauliflower curry, mixed with rice for a quick supper. It’s a variation of this recipe. 1. In a medium pot, heat oil over medium heat. Saute onion until soft, 5 or so minutes. Add cumin, chili powder, curry powder, and turmeric and stir. Saute for another 2 minutes. 2. Add potatoes and cauliflower and stir. Let the cauliflower and potatoes pick up the spices for about 2 minutes, stirring occasionally. 3. Add the water and bring to a boil. Add the tomato. After 5 minutes, turn the heat down. Add the cilantro, salt and pepper. Let simmer until the potatoes and cauliflower are soft. 4. Serve with rice and garnish with additional cilantro. I’m hungry and this looks really good! Fantastic work. Difficult to find an article of this quality.